The Discovery Channel's Race to Mars will send six astronauts on a Mars mission during a three-hour mini-series set to air in Fall 2007. Astronautsare stomping around Mars without ever leaving Earth in Canada, where filming is underway for an ambitious new documentary and mini-series thatblur the line between science fact and fiction. Clad inspacesuits on sets awash in red dust, actors are portraying future astronautsin the television mini-series Race to Mars, a Discovery Channeldocu-drama aimed at realistically depicting a manned mission to the red planet.The three-hour program, a six-part documentary Mars Rising, and arelated Internet site Mars Interactive are set to debut in Fall 2007 onthe Discovery Channel and its broadcast partners. Paul Lewis,president and general manager of Discovery Channel Canada, said the Marsprogram highlights what would be "the biggest and most exciting, most dangeroushuman scientific expedition that can be taken in the near term, perhaps in ourlifetime." "This wasa bit of a personal dream of mine to kind of take the mission to Mars," Lewis toldSPACE.com, adding that he had fond memories of NASA's Apollo Moonmissions during his childhood. "Hollywood's taken acouple of stabs at it, but I didn't think anybody has done the mission justiceand done it in a way that would be truly scientifically authentic." Asexpected, Race to Mars is set in a near-future--2030 to be exact--where China has surged ahead of the United States and other nations in Marsexploration. China's space ambitions apparently lead to a red planet race that prompts Canada, the U.S., Russia, France and Japan to mount the first manned Marsmission. Four menand two women--including a veteran cosmonaut, French nuclear physicist andCanadian astronaut who, not surprisingly, will play a key role in the mission--will launch toward Mars in the upcoming series, which will star actor MichaelRiley (Supervolcano, This is Wonderland) as astronaut Capt. RickErwin, Discovery Channel officials said. Production is underway in Montreal and St-Hubert, Quebec and will continue through mid-June. The $18.1million ($20 million CDN) production - which covers Race to Mars, anadded one-hour faux-documentary retrospective by the flight's "astronauts," MarsRising and the website--is being billed by Discovery Channel as the mostexpensive science television project underway this ye 2006, though programmanagers are hoping its realism and detail will prove worthwhile. More than twoyears were spent in preparation for filming, including meetings with Mars andspaceflight experts, Lewis said. "One of theimportant goals, frankly, for us was to see if we could start to generatepublic interest, public excitement about human exploration of space again,"Lewis said. "It's obviously something that really hasn't fired people'simaginations for a long time ... Our feeling is people are wiling to be inspiredagain." In Canada, the stand-alone Mars Rising documentary--which covers the challenges of an actual Marsflight--will air prior to the mini-series itself. "It willkind of be like a month of Mars," Jodi Bloom, manager of programmingcommunications for the Discovery Channel, told SPACE.com. In the U.S. the documentary is slated to appear on The Science Channel, though plans for themini-series are still developing, Lewis said. Race toMars stems from thepens of veteran science fiction writing team of Judith and GarfieldReeves-Stevens and Canada's Galafilm, Inc. production house. "Just asCapt. Rick Erwin assembled the 'best of the best' for his pioneering mission toMars, so too have gathered the most comprehensive research, technologicallyaccurate effects, strongest cast and most compelling writing team for thisintensive Race to Mars production," Phyllis Platt, the film's executiveproducer at Galafilm, said in a statement. Documentary-likedepictions of human space exploration seems to be on the rise. The BritishBroadcasting Corporation's (BBC) Space Race--a fact-based version ofthe U.S.-Soviet Union Moonshot rivalry--is set to debut in the U.S. on theNational Geographic Channel next month and follows the U.K. firm's Space Odyssey(also known as Voyage to thePlanets and Beyond), which chronicled an international group of astronautsas the explore Venus, Mars and the outer planets. 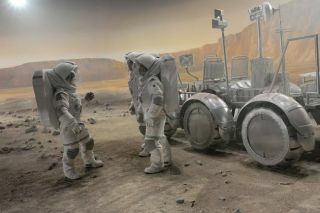 In the U.S.at least those productions have a root in NASA's Vision for Space Exploration,which aims at returning astronauts to the Moon by no later than 2020,and then pushing outwards to Mars and beyond. China too -with its steady string of humanspaceflight successes and lofty space station andlunar plans--also provides a real life hook in a time where humanspaceflight seems to lack the emphatic and unified public support that pushedNASA to the Moon during the Apollo era. Some members of Congress have even saidthat the U.S. is already in a new spacerace with China, and already losing. "Icertainly do think that if the American public thought that the Chinese weregoing get to Mars first, there would be a huge groundswell of support for thiskind of mission," Lewis said, adding that in Race to Mars, the rivalry offers adramatic angle. But stillMars, it seems, continues to beckon. Two NASArovers, Spirit and Opportunity,have surpassed all expectations as they continueto roll across the Martian surface more than two Earth years since landingon the red planet. A new Martian satellite - NASA's MarsReconnaissance Orbiter - arrived in orbit this year and is slowly honingits orbit into a circular path. NASA alsohopes to launch its Phoenixlander towards Mars in August 2007, while Europe and Canada plan missions of their own. "If [Raceto Mars] does in some small way get people thinking and talking about a missionto Mars, I think we would have done a really great thing," Lewis said.